This tasty quiche is a great combination of Louisiana flavors. The andouille sausage spices up the basic filling along with some Creole seasoning and lots of cheddar cheese. 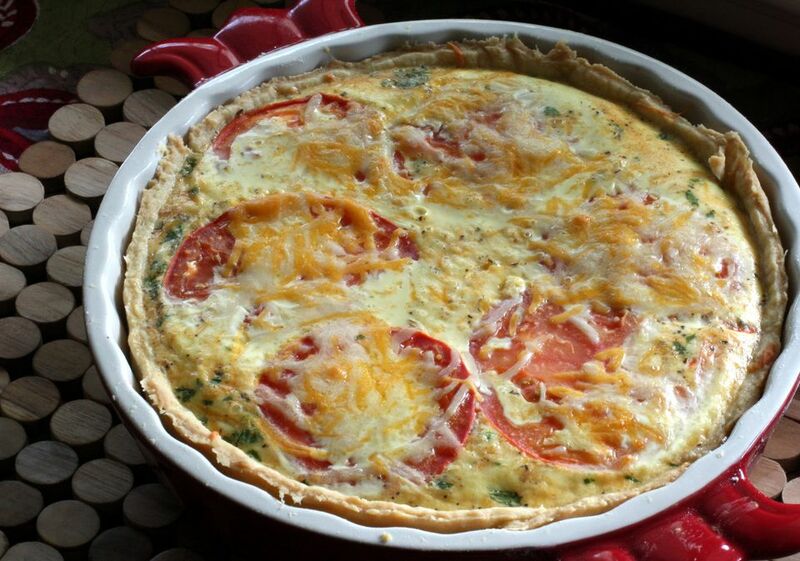 This makes a good brunch or lunch quiche, or serve it for dinner with soup and a salad. Feel free to use another smoked sausage in this recipe if you prefer less heat. Use a quiche baking dish or large, deep pie plate to make one pie. If you use frozen pie crusts for this dish, the filling will probably be enough to make two quiches. In a food processor, pulse the flour and salt to combine. Add the butter pieces and pulse about 7 or 8 times, until the mixture is crumbly. Pulse while adding the cold water until the dough begins to hold together. Transfer to a floured board and roll out. Fit into a quiche dish. Cover the crust bottom and sides with foil and add pie weights or beans to the foil to weigh the crust down. Bake for 10 minutes. Remove from the oven and remove the foil and weights. Set aside to cool. Melt the butter in a skillet over medium-low heat. Add the onion and sauté for about 4 to 5 minutes, or until lightly browned. Remove the onions to a bowl and set aside. Thinly slice the sausage and add it to the skillet. Cook the sausage until hot and lightly browned. Remove the sausage to paper towels to drain. Meanwhile, in a bowl, whisk the eggs with the milk or cream. Add the pepper and Creole seasoning. In the partially baked crust, arrange the sausage slices, sautéed onion, and chopped parsley. Cover the sausage mixture with about 1 cup of the shredded cheese. Pour the milk and egg mixture over all. Top with tomato slices and the remaining shredded cheese. Bake for 25 to 35 minutes, until set.